Take one set of newlyweds, add two real-estate licenses and a West Shore Boulevard fixer-upper on the water. and what do you get? A short honeymoon. While wedded bliss was still a fresh, new feeling, Craig Shatto and Rae Catanese Shatto took on a major home-renovation project, transforming a squat, outdated house into a showpiece. They added not just mega square footage but also pizzazz. Now the home is a Spanish-style jewel worthy of its prime south Tampa location. 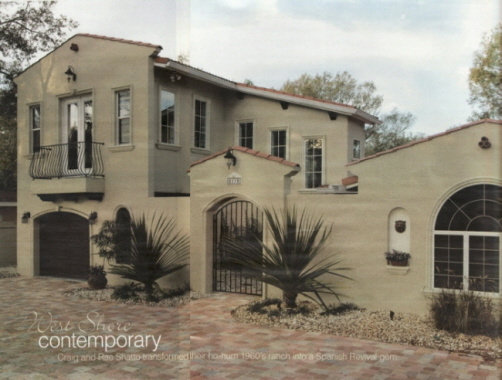 They did such a great job, their home was included in the Tampa Bay 2006 Parade of Homes. As Realtors for Prudential Tropical Reality and Keller Williams South Tampa Realty respectively, Rae and Craig keep curb appeal at the top of mind. Not surprisingly, their home's charm is evident from the street. A circular driveway with Old English pavers is pretty but also accommodates visitor parking, a perennial problem with homes fronting West Shore. Interesting lines and arches continue the Spanish feel, as do the front courtyard fountain and the light terracotta colors of the house and roof tiles. "We knew the home had potential the minute we saw it," Rae says. Craig adds, "We thought what a great example of taking something unattractive and transforming it into something elegant." Inside, the home is equally showy. A polished concrete floor stained a light dove gray makes the downstairs seem like a Channelside loft. An architect's touch belies any makeover --the home seems to have sprung up new, with a pleasing flow uniting its open, contemporary spaces. Alan Dobbs of Florida Design Studio Corp. shared in the design with the Shattos. Complementing the open feel of the downstairs, the backyard vista with its landscape of pergola and boat-bedecked canal create an illusion of large scale. "Bayard Construction was the contractor on our home, and they did a great job of meeting our goals and staying within budget. Working with a contractor you can trust and depend on is half the battle," Craig says. Interior concrete steps transition into a carpeted staircase that leads past three large, stepped windows. Long pendant lights show off original artwork. The house packs luxury living into its two-story five-bedroom, three-bathroom floor plan, adding up to approximately 3,000 square feet. A built-in plasma aquarium echoes the sea life in the nearby bay. A large down-stairs home office has it's own entrance. 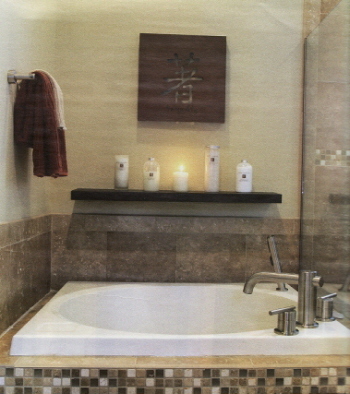 The master bathroom features a Japanese soaking tub, or "furo," complete with the traditional deep soaking area. A balcony overlooking the water is a reminder of the pleasures waiting at the workday's end. The couple has spotted many tropical birds, including osprey, herons and red hawks, and even a dolphin hunting in the canal. The project was no minor renovation. Windows, air conditioning, green-board drywall in the downstairs (a proactive measure against flood damage), plumbing and electrical work -- all were installed new. Equally ambitious, adding second story to the former ranch included erecting 40-foot solid engineered beams for support. Looking at before-and-after photos, you would never guess this was the same house. Downstairs, a brick load-bearing wall was removed to double the size of the family room. 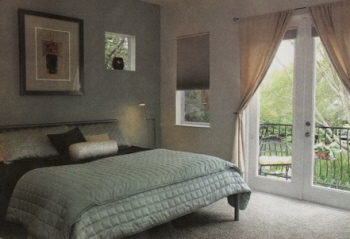 Upstairs, the new game room and the master bedroom suite create a quiet retreat with a bird's-eye view of the canal. The master bathroom has double vanities, a large double-headed shower and an ideal location for a laundry chute, making chores easier. In the kitchen, light wood cabinets with frosted glass fronts and a rare granite on the counter tops create space for cooking while chatting with guests. Ramos Marble and Granite on North Armenia Avenue installed the gleaming counter tops, with a "silver galaxy" pattern mined in Italy. A butler's pantry has enough room for a wine stem glass display. The downstairs bathroom, which features a vessel sink and brushed-nickel wall-mounted faucets, takes the contemporary theme full circle. Other Tampa-area home-renovation companies contributed to the project as well: Concrete-n-Counters on Dale Mabry Highway did the floors, while Future Form Foam of Bradenton fashioned custom hard-as-a-rock foam moldings around windows and doors. Royalty Driveway Concepts installed the elegant Old English brick pavers. KRT Cabinets created the custom maple kitchen cabinets, In addition to painting the house, De La Pava Painting refinished the home's original 1968 front doors--curiously enough, the hardwood is carved with traditional pattern of squares on one side, but on the opposite side each square contains a circle. "We flipped the doors, installing them with the circle side facing the interior, to go along with our contemporary look, leaving the more traditional side facing out," Craig says. Another vendor must be mentioned: Metropolitan Decor of Clearwater, which staged ikebana-design floral arrangements for the tour of homes. Metropolitan Decor, a high-end boutique decorating firm, happens to be owned by Rae's mother, Italian-born Catherine Catanese. Catanese helped the newlyweds with other decorating choices as well, including lighting and plumbing fixtures, wall colors and furniture placement. 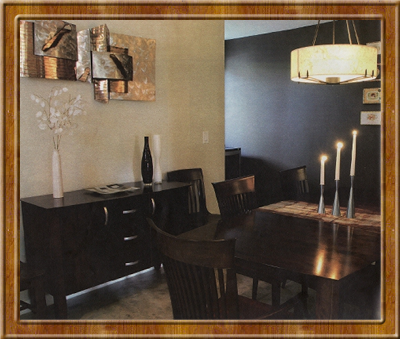 "My mother always has great ideas about furniture placement and accessories. I love her artistic style," Rae says. A couple that make their livelihood from real estate and development, Rae and Craig knew exactly what they wanted in their own home. The backyard deck extends over the water, and Craig built the pergola's wooden ceiling with planks reclaimed from the original family room demolition. Other custom touches include using only solid wood doors throughout the house and incorporating French doors--throughout the new design. Practical extras include over insulating the interior walls and exterior walls, creating soundproofing that cancels out car noise from the busy street. Energy Star appliances, block construction, low-voltage lighting and double-insulated windows are further evidence of energy-consciousness. In-ceiling speakers throughout the digital wireless home, a two-car garage, low-maintenance yard sprinkler and drainage system throughout the property--Rae and Craig drew up a full wish list and make it a reality. If the Shattos were writing their own real-estate ad, it might say something like: "South Tampa waterfront executive home; a jewel; perfect for entertaining; turnkey; must see to believe!" They have put so much of themselves into it. Not only is the "location, location, location" perfect for their work and play styles, but also with a schedule that sometimes demands work seven days a week, they appreciate the serenity the artfully designed space brings. Their contemporary home reflects a contemporary life lived to the fullest.